Wow. I mean, Wow. Did that guy just say what I think he said? Their idea is they inject ads into your stuff (here we go again with the cost per thousand downloads)). They pick where the ad goes. OK, You can manually pick where it goes if you're not happy. Can you see that? You're guest pauses to answer a question and an ad is inserted. Never, Ever, EVER give control of your feed to someone. The only way I would consider this (and for the record I'm not at all) would be if I had control over my feed, and there was a way to put in a iTunes Redirect without having to contact the company (like Libsyn.com does) AND I could also put in a 301 permanent redirect (like Feedburner does if you delete a feed). So thank you, but NO FRICKIN WAY. Don't let the lure of money stir up your emotions and pull you into bad decisions. Please. My favorite is they want the heart of your podcast (your feed) and there is not ONE word about who these people are, or what kind of money are we talking (cpm, cpa). They have 39 podcasters signed up, and 11 advertisers. I need to repeat this. 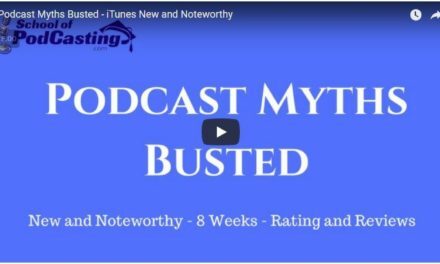 Join the School of Podcasting where you get up to date tutorials that help you avoid the common podcasting pitfalls, and gt you on the road to pain free podcasting.